McMURDO STATION, Antarctica, April 27, 2011 (ENS) – Two electric vehicles have traveled farther south than any EVs have gone before – to the U.S. research base at McMurdo Station. If these E-Ride Industries EXV2s can prove they are tough enough to take the harsh conditions in Antarctica, electric vehicles could replace the extensive fleet of diesel trucks, snowmobiles and buses at the base. Testing these vehicles’ batteries will be key to understanding how EVs perform in extremely cold climates. They must withstand temperatures that dip below -50 degrees Fahrenheit (-10 degrees Celsius) at McMurdo Station. “This project is specifically looking at reducing the amount of petroleum used down in Antarctica,” said senior task leader Ted Sears with the U.S. Energy Department’s National Renewable Energy Lab, NREL. Located on the southern tip of Ross Island, on the shore of McMurdo Sound, the station is the largest community in Antarctica, capable of supporting up to 1,258 residents. With a harbor, three airfields, a heliport and more than 100 buildings, it serves as the U.S. Antarctic science facility. The polar regions are pristine research environments and the National Science Foundation’s Office of Polar Programs is working with NREL and the Department of Energy to incorporate more renewable energy and energy efficiency practices into its polar facilities. “Each gallon of fuel NREL can demonstrate can be displaced with renewable energy will make a real difference,” Sears said. “At this point, it looks promising given that two renewable resources – solar and wind – are already on the ice and can be used to power vehicles. So, we’ve put two test electric utility vehicles down there, to see how they function,” Sears said. Researchers thought these were the units that would best fit the kind of vehicle uses found in Antarctica where pickup trucks are now the vehicle of choice. “E-Ride’s EXV2 was chosen mainly because of its truck frame and its design as a utility vehicle,” said NREL senior mechanical engineer Ian Baring-Gould, who leads the laboratory’s work in polar environments. The E-Ride EXV2 is designed as a two-person vehicle with a truck-like bed and larger utility style tires for use on dirt roads. It has a maximum speed of 25 mph and uses lead-acid batteries. 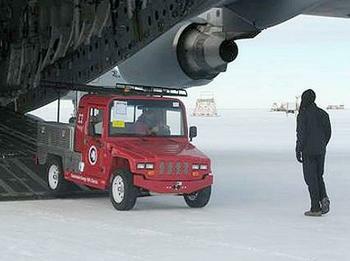 For deployment to Antarctica, the EVs were outfitted with insulation for the batteries as well as battery heaters. National Science Foundation and Raytheon Polar Services jointly own one of the vehicles and the National Renewable Energy Lab owns the other. The E-Rides’ plane landed on the ice at McMurdo in February, on one of the last flights before the harsh winter season set in. To date, the EVs have been driven more than 70 hours and logged nearly 140 miles. The data collection will continue for at least one year, covering the coldest months and the milder summer months. Not only in Antarctica but around the world, there are many remote locations looking at renewables to reduce fuel use.